Sir Geoffrey Cory-Wright, 3rd Bt. was born on 26 August 1892.1 He was the son of Sir Arthur Cory Cory-Wright, 2nd Bt. 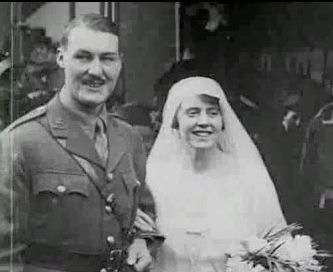 and Elizabeth Olive Clothier.3 He married Felicity Tree, daughter of Sir Herbert Beerbohm Tree and Maud Holt, on 10 November 1915.1 He died on 23 March 1969 at age 76. Her married name became Kirkley.1 Her married name became Douglas. [S6] G.E. Cokayne; with Vicary Gibbs, H.A. Doubleday, Geoffrey H. White, Duncan Warrand and Lord Howard de Walden, editors, The Complete Peerage of England, Scotland, Ireland, Great Britain and the United Kingdom, Extant, Extinct or Dormant, new ed., 13 volumes in 14 (1910-1959; reprint in 6 volumes, Gloucester, U.K.: Alan Sutton Publishing, 2000), volume I, page 240. Hereinafter cited as The Complete Peerage. [S2] Peter W. Hammond, editor, The Complete Peerage or a History of the House of Lords and All its Members From the Earliest Times, Volume XIV: Addenda & Corrigenda (Stroud, Gloucestershire, U.K.: Sutton Publishing, 1998), page 38. Hereinafter cited as The Complete Peerage, Volume XIV.